There's a high demand for fresh Christmas trees in Mississippi. And as MPB's Ashley Norwood reports, farmers are raising a larger number of trees to meet that demand. "Right over here we have a tree called a Portuguese cypress," said Don Kazery. On the Kazery's Christmas Tree Farm in Jackson, there are 1,000 trees. He shows us one on his three-acre farm. 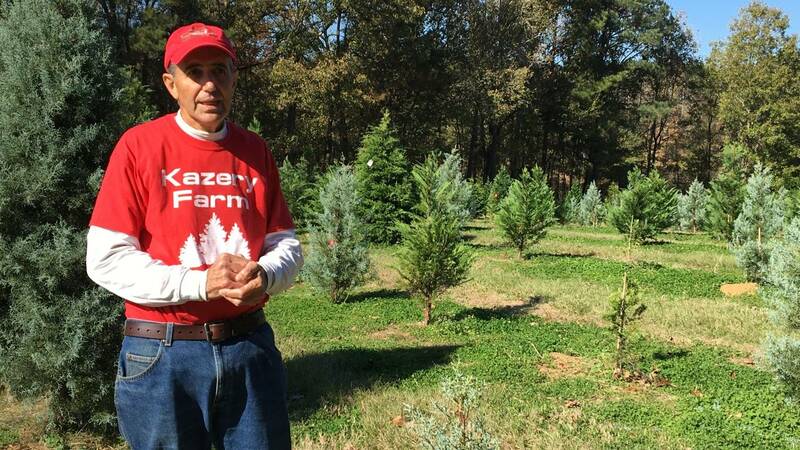 Kazery has been growing Christmas trees for 15 years. He says the families who come to choose and cut their Christmas trees make his year-round labor worthwhile. "Families have been so happy. They like that tradition. They like the experience.We've had families that their kids have grown up and their kids have come back," said Kazery. Kazery says 200 hundred trees are for sale on his farm. According to a recent crop report, Christmas tree farmers in Mississippi are expecting a seven percent increase in sales this year versus the last two years. Dr. Stephen Dicke is with Mississippi State University. He says some weather conditions were unfavorable, but overall it was a good year for Christmas tree farmers. "Christmas trees are kind of unusual because its a four to five-year crop. The inventory you're looking at is five years of inventory. You could lose some trees but you have a year or two to make it up before you began selling those trees," said Dicke. Dicke says there are 30 Christmas tree farms in Mississippi.